Biography of Norwich School Landscape Painter. English landscape painter John Crome was founder of the Norwich School. He trained as a coach painter until 1790. His ambition was to become a landscape painter and he was encouraged by a local collector, Thomas Harvey, who allowed him access to his large collection of British and Dutch paintings. In this way, Crome assimilated the naturalism of artists Meindert Hobbema (1638-1709), Jacob van Ruisdael (1628-82), Jan Wynants (c.1625-84), as well as Thomas Gainsborough (1727-88). By the 1800s he had developed his own style of landscape painting, always based on the rustic East Anglian scenery. In 1803, Crome helped found the Norwich School of Artists, a group of painters which included the watercolourist John Sell Cotman (1782-1842). Crome painted in oils and watercolour and many of his works can be found at the Tate Gallery and the Royal Academy. He is often called 'Old Crome' to distinguish him from his artist son John Bernay Crome (1794-1842). 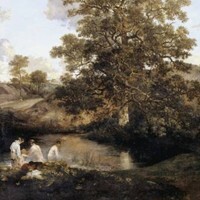 His paintings include View of Mousehold Heath near Norwich (1812, Victoria & Albert Museum, London) and The Poringland Oak (Tate Collection, London). Crome was born in Norwich in 1768, the son of a weaver. At the age of 12 he was apprenticed to a coach and sign painter, Francis Whisler, where he learned the use of palette and brushes, and the basics of grinding and mixing colours. Around this period he became friends with the apprentice printer Robert Ladbrooke (1770-1842), who also became a landscape painter. Both would go on drawing trips into the fields and then sell some of their works to a local printmaker. It was also around this time that Crome met the collector Thomas Harvey, who had a large collection of works by artists such as Gainsborough and Hobbema. Through countless studies and drawings, Crome taught himself the skills he needed. Harvey wrote:I was able to give him upon the subject of that particular branch of art which he had made his study. His visits were very frequent, and all his time was spent in my painting-room when I was not particularly engaged. He improved so rapidly that he delighted and astonished me'. Crome also received some instruction from established artists such as portrait and historical painter John Opie (1761-1807) and portrait painter Sir William Beechey (17531839). Crome was also influenced by the work of Welsh artist Richard Wilson (1714-82), a founding member of the Royal Academy in 1768. Wilson, one of the first British artists to appreciate the aesthetics of the countryside and is considered the father of landscape art in Britain. In fact Crome was to state in the catalogues of exhibitions for the Norwich School of Art that his drawings were 'after Wilson' and 'in the style of Gainsborough'. Crome's early landscapes were highly detailed; he was one of the first artists of his generation for example to represent specific tree species in his works, as opposed to painting generalised forms. One of his earliest masterpieces was Moonrise on the Marshes of the Yare (c.1808, Tate), where it depends not on colour for effect (mainly he used browns and greys), but on light. It demonstrates what can be achieved with a limited palette. In 1803, Crome along with Ladbrooke founded the Norwich Society of Artists, whose members comprised the Norwich School. In fact it was the first provincial art movement in Britain, and became an important contributor to the tradition of English landscape painting. Norwich School painters - amateurs as well as professionals - were typically inspired by the flat East Anglian landscape with its Broads and rivers, which they depicted using the new method of plein air painting. They were also influenced by Dutch Realist landscape such as Hobbema and Jacob van Ruisdael (1628-82). Initially the School started as a club in a local tavern where artists could meet to discuss artistic ideas and technique. Within 2 years, they had moved to their own premises where they worked and exhibited together. The first exhibition was launched in 1805 and was such a success that it became an annual event for the next twenty years. In 1828 they moved to another venue and reconstituted themselves as The Norfolk and Suffolk Institution for the Promotion of the Fine Arts, where they continued to exhibit until 1833. In addition to Crome, Ladbrooke and Cotman, important members of the Norwich School included: James Stark (1794-1859), Joseph Stannard (1797-1830), George Vincent (1796-1831), Alfred Stannard (1806-89), John Thirtle (1777-1839), and H Ninham (1793-1874). Crome rarely travelled very far outside of his county, and as a result had little contact with well known artists of his day. He first exhibited at the Royal Academy in London, in 1806, but exhibited irregularly thereafter. With very few exceptions, his chosen subject matter remained the local landscapes. As one art critic wrote, Crome painted 'the bit of heath, the boat, and the slow water of the flattish land, trees most of all, the single tree in elaborate study, the group of trees, and how the growth of one affects that of another, and the characteristics of each'. Another commented: 'No other painter, except for Jean-Francois Millet, has conveyed so well the friendly strength of the earth and the things that grow from it.' He became a master draughtsman and in particular an expert at depicting the English Oak tree (whereas Constables favourite tree was said to be the ash). An example is his The Poringland Oak (Tate, oil on canvas). This painting dates from later in Crome's life, when he was experimenting with etching as an art form. The details are great, the branches, the leaves and the jagged edges of the clouds. It is also a study of light, as the sun begins to set, almost pre-empting Impressionism. Another example is The Blasted Oak (c.1808, Norwich Castle Museum, watercolour), which displays a naturalistic style of landscape painting. Dutch influences can be seen in his paintings of Mousehold Heath near Norwich, which bear some similarities to works by Aelbert Cuyp (162091). Although Crome may have come under the influence of many artists, he did develop his own unique style early on, which he adhered to with little or no change throughout his life. Crome's reputation was limited to Norfolk during his lifetime, where he made a reasonable living not only through selling his paintings, but also acting as an art dealer and restorer. He was a skilled etcher, completing the majority of his etching between 1809 and 1813 - but none were reproduced until after his death. It is remarkable that an artist with so little education, should have developed a School of painting in a city where art, beyond portraits of local merchants, was almost unknown. The only trip Crome took outside of Britain was in 1814 to Paris, where after the downfall of Napoleon, the English flocked to Paris to see the treasures in the Louvre, the spoils of Napoleon's victories. (Four years later Chrome's compatriot, the short-lived English landscape genius Richard Parkes Bonington (1802-28) would arrive in Paris to study under Baron Gros.) On his return to Norfolk, Crome settled again to the natural scenery surrounding him, proclaiming he painted for 'air and space'. The artist died in 1821, his last words were "Hobbema! My dear Hobbema, how I loved you!" Paintings by John Crome can be seen in some of the best art museums in England.